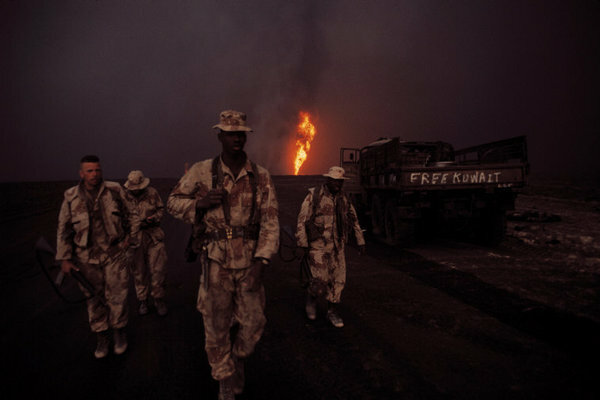 The invasion of Kuwait by Iraqi troops that began 2 August 1990 was met with international condemnation, and brought immediate economic sanctions against Iraq by members of the UN Security Council. U.S. President George H. W. Bush deployed American forces into Saudi Arabia, and urged other countries to send their own forces to the scene. An array of nations joined the coalition. The great majority of the military forces in the coalition were from the United States, with Saudi Arabia, the United Kingdom and Egypt as leading contributors, in that order. Around US$36 billion of the US$60 billion cost was paid by Saudi Arabia. The war was marked by the beginning of live news on the front lines of the fight, with the primacy of the U.S. network. The war has also earned the nickname Video Game War after the daily broadcast images on board the American bombers during Operation Desert Storm. The initial conflict to expel Iraqi troops from Kuwait began with an aerial bombardment on 17 January 1991. This was followed by a ground assault on 23 February. This was a decisive victory for the coalition forces, who liberated Kuwait and advanced into Iraqi territory. The coalition ceased their advance, and declared a cease-fire 100 hours after the ground campaign started. Aerial and ground combat was confined to Iraq, Kuwait, and areas on the border of Saudi Arabia. However, Iraq launched Scud missiles against coalition military targets in Saudi Arabia and against Israel.